When a bunch of reviews hit, it's useful—and sometimes funny—to see how they echo each other, and how they differ. 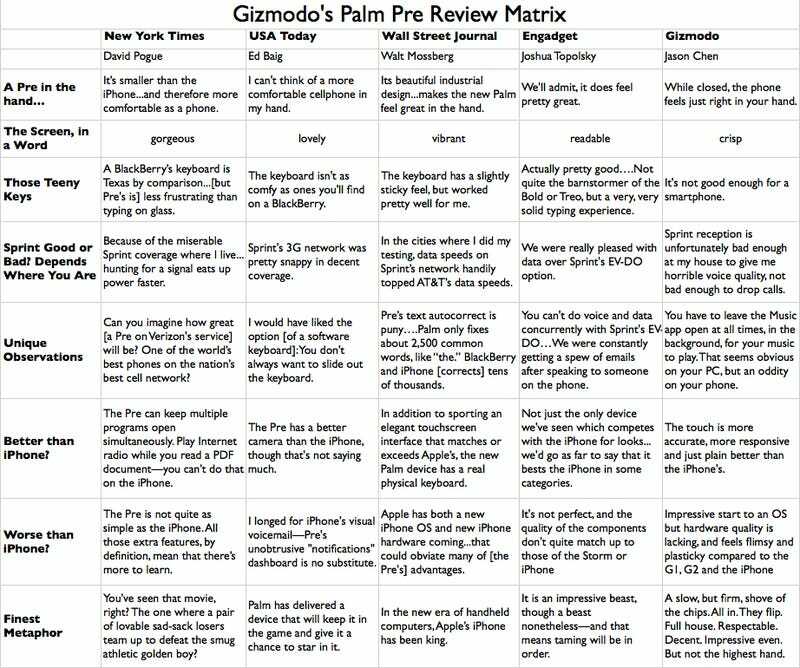 In the Palm Pre reviews, nobody used the word "iPhone" as much as WSJ's Walt Mossberg—he was a third more likely to use it than his colleagues David Pogue (NYT) and Ed Baig (USA Today) were, and he even lead with a discussion of it, before mentioning the Pre. Nobody wrote nearly as long as Josh at Engadget: His review is over 10,000 words; ours, the next longest, was just over 3,000. There was a lot of consensus here, though notable disharmony when it came to Sprint service and the Pre's tight keyboard. Of course, there's no way to fit even all the main points into the review matrix, so if you want to go and check out the other reviews for yourself, damnit, you should! *Apologies for not including Steven Levy's piece from Wired. We saw it too late to include it in the mix.